New rules mean firefighters who contract certain reproductive cancers on the job will now be compensated and supported. 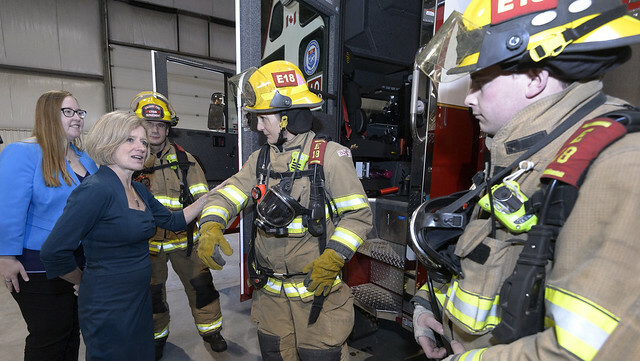 Premier Notley and Minister Gray meet with Calgary firefighters (L-R) Mike Andrusco, Shalee Stair and Peter Cone at the Calgary Firefighters Training Academy. The Government of Alberta is making sure firefighters who contract ovarian and cervical cancer will receive workers’ compensation benefits and supports, making Alberta the leader in Canada. The minimum exposure period will be 10 years for these cancers. Government is also reducing the minimum exposure period from 20 to 10 years for compensation for testicular cancer. More than 14,000 full-time, part-time, casual and volunteer firefighters serve Albertans. Approximately eight per cent of Alberta firefighters are women. Approximately 80 per cent of firefighters are volunteers. The Firefighters’ Primary Site Cancer Regulation came into effect in 2003 and is part of the Workers’ Compensation Act . Reduce the minimum exposure period for testicular cancer from 20 to 10 years. Add female-specific cancer types: ovarian and cervical cancer (minimum exposure period at 10 years). Remove the expiry date of the regulation.